What Kind Of Moldings Do I Need? Types of will depend on what type of installation you're dealing with. 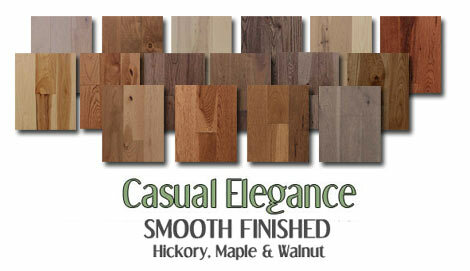 For instance, a floor that will be sanded and finished on site does not come with actual moldings. 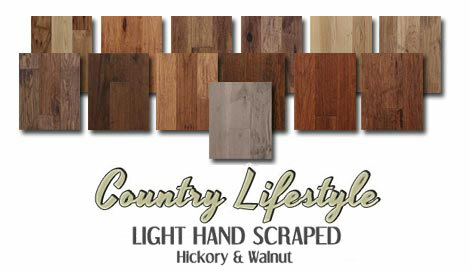 Often the installer will cut the trim from the actual hardwood being used to a desired shape with a table saw. Once the installer leaves it's up to the floor finisher to smooth them in preparation for finishing. 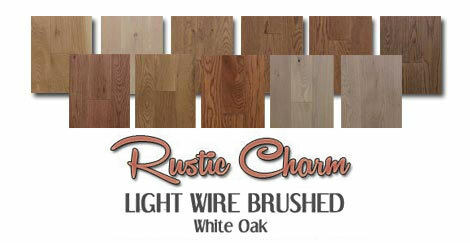 This is also true with high end 3/4 inch installations where trim is rarely used. 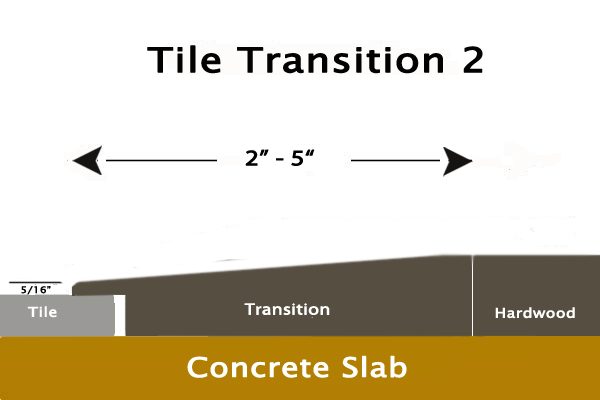 Examples could include areas adjacent to ceramic tile, or natural stone (shown right). 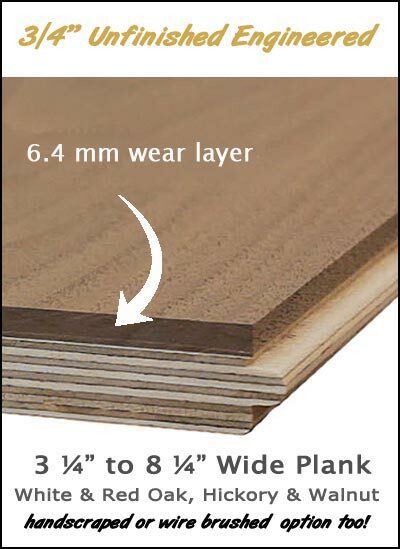 Often a decorative element in the role of header boards from the same material is used to finish off the area. Expansion areas are still kept in the form of silicone caulk that match the size of grout joints. Stair nosing, reducers, baseboard, and or quarter round are still used in the above scenarios. 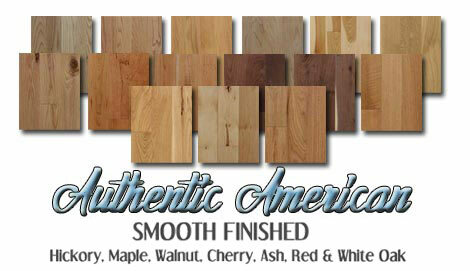 Uptown Floors offers any conceivable molding to coordinate with your flooring. However, more times than often they are not needed with our ¾” engineered. Stores that do more carpet than hardwood will suggest common moldings. They simply don’t have installers that will spend the time to make it look more attractive. 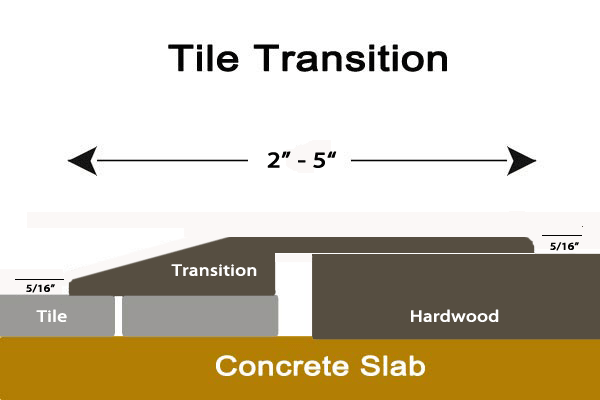 Times when it may be necessary could include transitioning from tile, stone and the like to hardwood that have different vertical heights, or transitioning to hardwood where the tile was not cut straight. 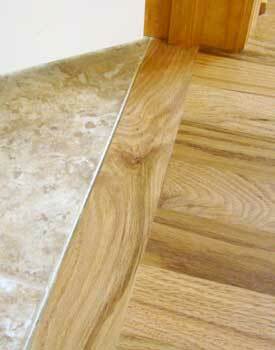 See butting hardwood to tile without moldings. We sometimes have buyers with a laundry list of moldings from the guy who is doing the work. Anytime I see end caps on the list, I know it’s time to have a chat or refer them to this page for a summary. Definitely with a floating floor, but our products are not designed to be floated, nor will we warrant any such installation. 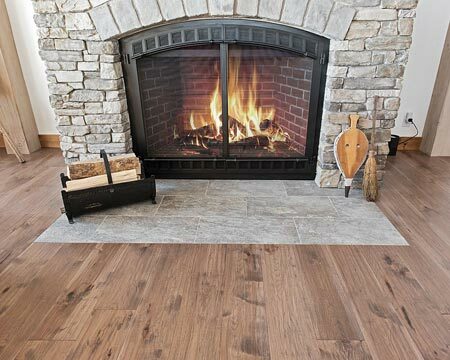 They are high end quality made to be installed in traditional methods offering the feel hardwood floors should have; firm and secure to the sub floor. Keep in mind a small area of expansion is suggested (mentioned above). One that will not be noticeable from a standing position unless you’re looking for it. 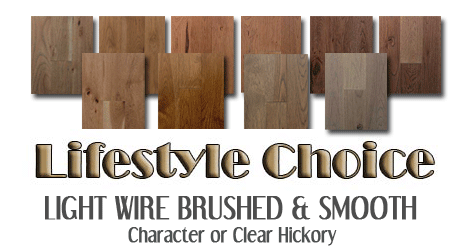 Often times it will not be necessary providing one keeps an eye on the homes’ interior relative humidity. Excessive high or low levels for an extended period of time can have an effect. Next on the laundry list. Finishing off the areas adjacent to carpet. Sure, an actual reducer does look good, but a baby threshold or end cap? Not in my book. For one it’s uncomfortable to walk on barefoot if you’re not looking. Secondly it’s a matter again of a carpet store method. Same situation unless the hearth is lower or higher than the finished vertical height of our ¾” engineered. 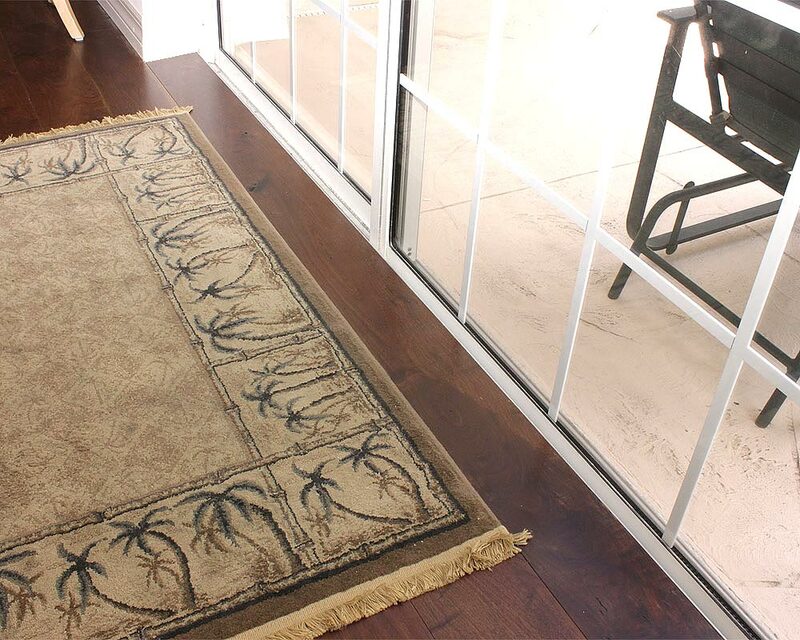 This is commonplace with remodels, but can be eliminated in new construction providing you plan for it. 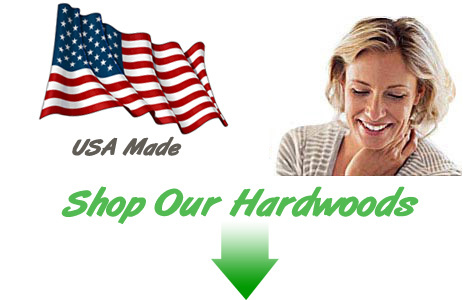 We’ve handled a number of custom moldings providing we have the proper profile. 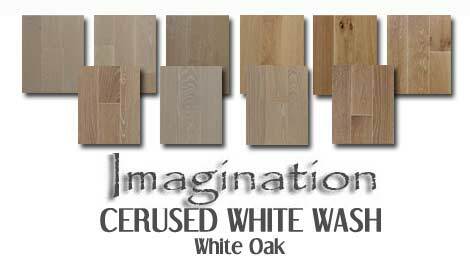 With our ¾” engineered an overlap tile to hardwood transition is used. Looking for a wider transition than the one shown below? No problem, just let us know. This works for those that want a gentler slope. It’s also covers irregular cut tiles. For this to function properly a cushion or bead of silicone caulk must be placed under the left side ‘tongue’ of the reducer. Failure to do so can crack or break off the tongue of the reducer. 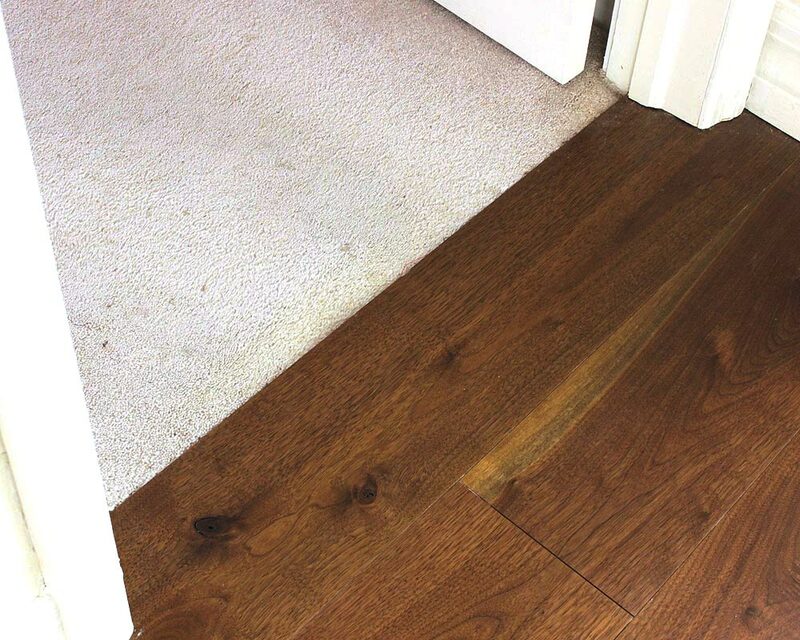 This also applies to the first transition shown that overlaps the hardwood. 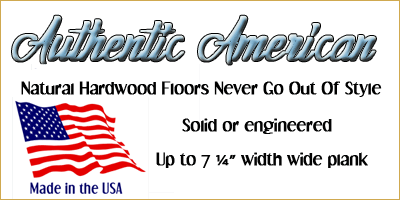 For orders that ship with your flooring the maximum length runs twelve feet. 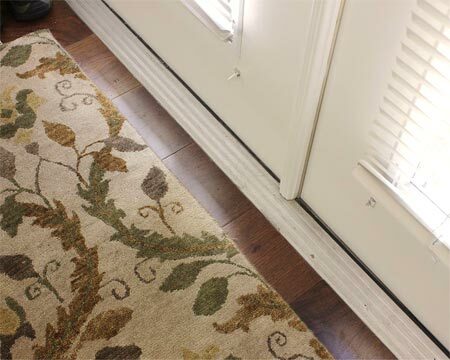 Any forgotten moldings after shipment can only run eight feet in length as they are shipped UPS ground with their maximum length specifications.